I am a huge fan of the wrap bracelets from Beautiful Silver Jewelry. 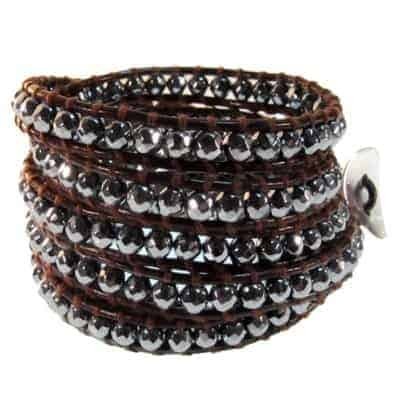 My favorite is “Journey” which is a wrap bracelet that features gorgeous faceted hematite bead on an extra long brown leather cord. The gray/black color combination is stunning and it has an amazing sparkling gleam that is so eye catching with a rich quality to it. I like the attention to details such as the adjustable silver buttons and loops that are attractive and make this easy to adjust and fasten. The Hematite Wrap can be worn as a traditional bracelet, ankle bracelet or even a boot wrap. I appreciate that it has an extra long length so I can wear it many different ways. I have two pieces in my jewelry collection from Beautiful Silver Jewelry and I wear both bracelets on a regular basis……two of my favorites! The quality and attention to detail is exceptional and the prices are very affordable so I can afford to mix and match the bracelets. The wrap bracelets come ready for gift giving in a pretty silver foil box and while you are purchasing a wrap bracelet for your family and friends, why not pick one up for yourself too! You can purchase the Hematite Wrap Bracelet from Beautiful Silver Jewelry for only $43.95 (SPR $189!). One lucky reader will receive a gorgeous Wrap Bracelet from Beautiful Silver Jewelry! I like the Sterling Silver Square Cushion-Cut Amethyst Pendant. I have always been a Amethyst Fan! I love the Sterling Silver Iolite Cluster 3.4 Carat Earrings. I love the Gemstone Bead Bracelet. Thanks for the chance to win! I like the Gold Bead Wrap Bracelet. I do love the black and silver wrap bracelet, black leather. (pearl jewelry). It would be great to win a giveaway! The Twlight Fire Mystic Topaz Bracelet with Peridot Gemstones is my favorite piece. I love the Sterling Silver Amethyst / Garnet Earrings, Bracelet, Necklace. I like the Sterling Silver 4.5 Carat Blue Topaz Pendant. I really like the Sterling Silver Classic CZ Ring. Its so simple, in a great way. I love the Natalie Pear-Cut Amethyst Pendant Necklace. Sterling Silver Celtic Pendant: Open Weave Triangle Design is my favorite piece! I’m pretty crazy about ALL of the “wrap bracelets” – but my most favorite favorite is the GORGEOUS Gold Bead Wrap Bracelet. It’s dazzling! All so gorgeous! I love this one: Sterling Silver Iolite Pendant with Amethyst, Peridot and Garnet Gemstones! I love the Sterling Silver Dolphin Pendant with an 18 inch snake chain!